I was in Munich the other day. I went to see the Haus der Kunst (House of Art). This is a large art museum that is now home to contemporary exhibitions. When I was there, there was a show by the Chinese artist Ai Weiwei. But what I really wanted to see was the building itself. It was built under the Nazis in the late 1930s and survived the war more or less intact. Hitler intended it to be the new home for German art. In his mad world German art would be freed of Modernist influences and the art of jews, Communists and anybody else he didn't approve of. And this museum was to be the new home to this ideologically cleansed German art. It was an embarassment to the Nazis that the exhibition of works by the banned, so-called "degenerate" artists (everybody that Hitler didn't like) was more popular than that of the officially approved new German artists who were shown here at the Haus der Kunst. Nazi ideology placed considerable importance on the arts. For those artists prepared to tow the party line (and with the required racial profile), the Nazis were good for business. Hitler himself was an artist of sorts and was keen to open the new museum himself when it was finished in 1938. There is a well-known photo of him delivering his speech to a bevy of luminaries in this very building. The building has changed very little since then. The monumental pillars of Nazi architecture are all there, the megalomania is still very present. It is not hard to find the exact spot where the Führer stood to delivery his speech and his views on arts policy. It is still somehow an eerie experience, standing in the footsteps of the most "evil" man in history. Europe is, of course, full of traces from Hitler and the Nazis, but for me at least, this was the first time I had stood in the same spot where he stood and delivered one of his withering speeches. It was a sobering moment indeed. 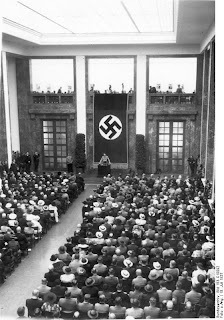 Photo: Adolf Hitler opens the Haus der Kunst with a speech in the main hall. The hall still looks much the same today.